VANCOUVER, BC, August 8, 2011. 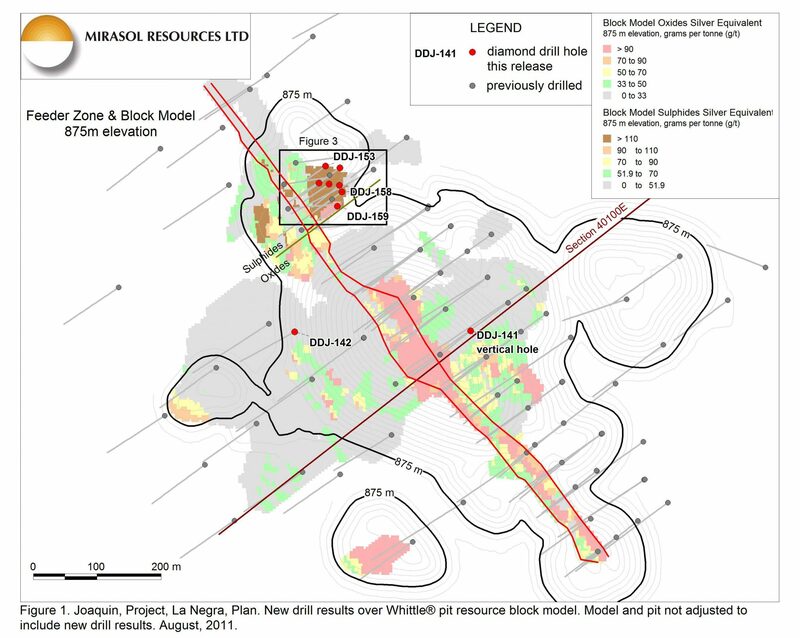 Mirasol Resources Ltd. (TSX-V: MRZ, Frankfurt: M8R) is pleased to announce results from infill drilling at the La Negra deposit, Joaquin Silver Project in Santa Cruz Province, Argentina. Highlights include a near-surface “manto” intercept of 31 metres grading 301 grams per tonne (“g/t”) silver and 0.26 g/t gold, that includes an intercept of 5.0 metres containing 1,081 g/t silver and 1.20 g/t gold in oxide mineralization east of the feeder zone in the central part of the deposit. In the northern part of the deposit, a shallow sulphide intercept returned 13.0 metres of 996 g/t silver and 1.47 g/t gold including 2.9 metres of 4,168 g/t silver and 1.53 g/t gold (Table 1). The Joaquin Project is a joint venture between Mirasol and Coeur d’Alene Mines (“Coeur”). Coeur is the operator with a vested 51% interest in the project and has recently elected to proceed to increase its equity to 61% by funding all expenditures through to the delivery of a feasibility study. Additional diamond drilling was recently completed at the project. 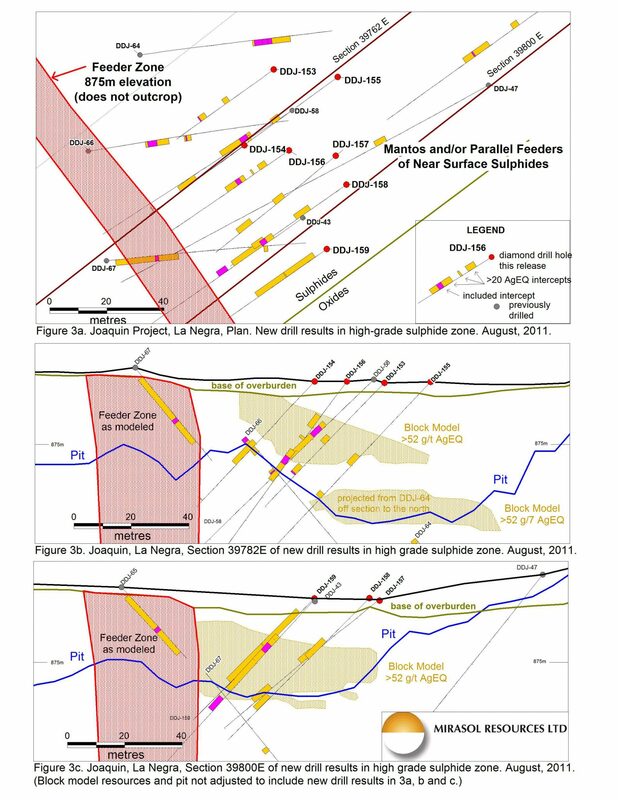 Results are now available for 9 holes (Figure 1) drilled at the La Negra deposit, all sited within the area of the previously defined mineral resource. Regional exploration drilling results will be discussed in a separate press release. The Joaquin NI 43-101 compliant, within-pit resource estimate currently stands at 19.6 million ounces of silver in the Indicated category and 47.9 million ounces of silver in the Inferred category (news release May 9, 2011). Coeur has stated that the current holes were drilled “in support of commencement of feasibility work”. Two of the nine new holes were drilled in the central part of La Negra to confirm the presence of the modeled “manto” (flat-lying) oxide resources, one on either side of the sub-vertical feeder zone. Both encountered multiple intercepts of oxide silver mineralization. Hole DDJ-141, east of the feeder zone, hit four separate intercepts of mineralization above a 20 g/t silver equivalent (AgEQ) cutoff (Table 1). The best of these intercepts has a core length of 31 metres grading 301 g/t silver and 0.26 g/t gold and includes an intercept of 5.0 metres with 1,081 g/t silver and 1.20 g/t gold. This intersection represents the highest silver gram-metre product interval on this cross section through the “manto” to date. Both holes confirmed the presence of the modeled mantos as seen in plan and cross section (Figure 2). At the northern end of La Negra, sulphide mineralization was previously discovered at shallow depths in hole DDJ-43 (news release Nov. 24, 2009) under soil cover with no outcrop exposures. In the resource model the geometry of the mineralization in this area was also interpreted as a steeply-dipping feeder with gently-dipping manto zones. In this phase seven holes were drilled in the north area to test the model (Figure 3). These holes all intersected near-surface silver mineralization. As with previous drilling, several of the new holes returned very high grade silver mineralization with associated gold. Highlights of these holes include DDJ-156 with 13.0 metres of 996 g/t silver and 0.42 g/t gold, including 2.9 metres of 4,168 g/t silver and 1.53 g/t gold. The new drill holes appear to confirm that the geometry of the mineralization in the northern area includes both steep and gently dipping bodies. However, mineralization in DDJ-159 returned 34.4 meters of 216 g/t silver starting from seven metres down hole, well above the depth predicted by the resource model (Fig. 3c) suggesting the “manto” may be thicker, and nearer surface in this area, than previously modeled. – Silver equivalent is calculated as AgEQ g/t = Ag g/t + 65 x Au g/t. Metallurgical recoveries are assumed to be 100%. – Primary intersections are calculated at a cutoff grade of 20 g/t with some internal dilution allowed at the discretion of the project’s Qualified Person. – “Included” intersections are calculated at a 50 g/t or higher cutoff grade. – Reported grades are not capped. Coeur has confirmed to Mirasol that it intends to resume drilling as part of the feasibility program in the third quarter and has assigned coordination of feasibility work to its project development team with support from their in-house technical services group. The exploration group will continue to be involved in work aimed at identifying new targets for drilling and finding additional resources at the Joaquin property, a large part of which remains unexplored. Mirasol is pleased to have Coeur advancing the Joaquin Silver Project towards feasibility, at its election and cost, at a time when silver prices continue to mark new records. Mirasol Resources Ltd. is a prospect generation exploration company focused on the discovery of new, high-potential precious metals deposits in the Americas. Mirasol currently holds 100% of the rights of twenty exploration prospects, including eight advanced exploration stage precious metals properties located in Santa Cruz Province of southern Argentina. These include the recently discovered Virginia Silver Project, where near-surface, oxidized mineralization is being outlined by shallow diamond drilling. The company operates subsidiary companies in Argentina and Chile, holds the strategic Rubi copper-gold porphyry property in Chile, and is engaged in generative exploration in prospective regions elsewhere in the Americas.